QUICKPLAY PRO AGILITY BASE WEIGHT Heavy-duty solid rubber base, has a top receiving hole that fits QUICKPLAY PRO Agility Poles and ensures they stay in place when a ground spike can't be used. Each base weighs X lbs, no need to fill with sand or water like other base weights. PLAY IN ANY WEATHER The pre-weighted base ensures agility poles and corner flags stay in place, even in windy weather. 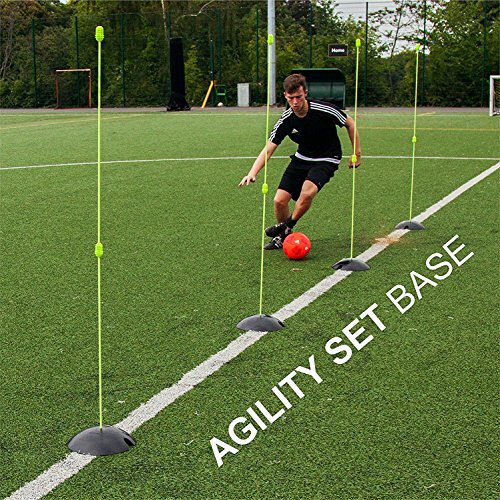 TRAIN ON ALL SURFACES The QUICKPLAY PRO Base Weight allows you to use your agility poles and other equipment on any surface where a spike can't be used, such as artificial turf, concrete or indoor courts etc. WIDE & LOW PROFILE BASE Spreads the weight out for excellent stability and has no steps or steep edges to help prevent tripping and ankle rolls. ESSENTIAL TRAINING TOOL - Improving footwork, speed and agility is essential in most sports including soccer, baseball, football, field hockey, track & field and more! A VERSATILE EQUIPMENT BASE WEIGHT - Use the Pro Base Weight to secure other sports equipment such as SKLZ Quickster Nets, Bownet Goals, Pugg Goals and other sports equipment to the playing surface. The PRO base weight features a 1in diameter slot on the underside, which fits over the frames of many different goals and nets. TRAIN ON ALL SURFACES - The QUICKPLAY PRO Base Weight allows you to use your agility poles and other equipment on any surface where a spike can't be used, such as artificial turf, concrete or indoor courts. WIDE & LOW PROFILE BASE - Spreads the weight out for excellent stability and has no steps or steep edges to help prevent tripping and ankle rolls. If you have any questions about this product by QuickPlay, contact us by completing and submitting the form below. If you are looking for a specif part number, please include it with your message.